Weaving is the process of interlacing fiber threads to make textiles. It is a remarkable craft which utilizes wooden tools such as looms, frames, and shuttles. An incredible art in and of themselves, these tools have been used by the traditional weavers of India to weave quality garments since ages. India is still one of those countries that creates its textiles from the magic looms of the master weavers. When he’s not traveling, one can spot him behind the lengthy bundles of colorful threads, weaving elegant fabrics out of his loom. Even at the age of 73, Bhaskaran is not ready to retire. All this because, he has made it his mission in life to revive the fine tradition of cotton weaving in India. His craftsmanship is embellished with a sense of pride in what he is and what he creates. What does it mean to be a woman with an artistic craft? It requires the courage to step away from the mainstream and limiting ideas of femininity. 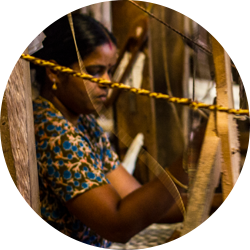 She is just one among many compassionate handloom weavers of this land of master weavers. 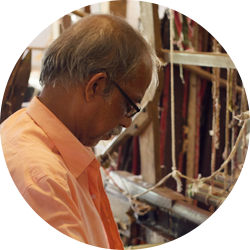 With an eye for detail and graceful efficiency, Kanaka weaves extremely fine threads of cotton. Combing through the 60-meter-long threads, C Mukundan sits to take away knots and glitches from the fabric to make them loom-ready. 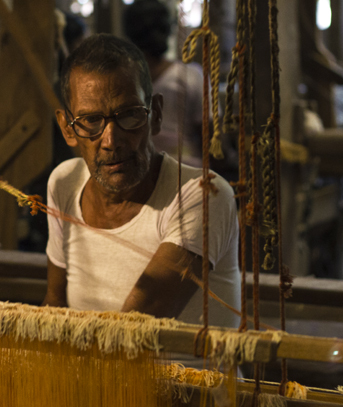 This passionate weaver is the first one to reach the mill and the last one to leave. He has a unique eye for detailing and the efficiency of an excellent weaver. 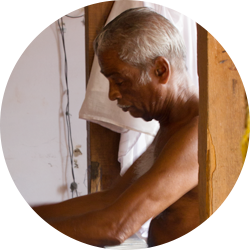 Govindan, the 72-year-old independent artisan, strongly believes in earning for himself and has an undying will to continue his passion. He is an expert in winding, warping, and weaving. 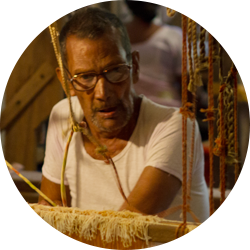 These are some of the master weavers of Kannur, who makes the land – the Land of Looms and Lores. Regions and communities throughout India have unique weaving traditions. But with a distinct quality, custom and pattern, fabric from Kannur have always stood out in the international market with much pride and glory, the land where thoppia also started its story decades ago. Customers from around the world appreciate the beauty and quality of the fabrics from Thoppia for the same reason. The generation of these expert weavers are sure to guard the weaving tradition in the coming years and will not let the looms lie lifeless.